My gosh how time has just flown by. I haven't written a post in absolutely ages... I guess this is due to the fact that Nina is now a lot more active, alert and requires a little more time from me. She is almost 8 months now. Chats ALL day. "Da da da da da, la lala lallllaaa"
Has two teeth. Bottom ones. Feeds herself bread, pasta and LOVES broccoli. Sleeps in her own room. Adores her big brother - she lights up every time he gets back from school. Loves feeling (or pulling) the cats' soft fur. Grabs anything and everything she can get her little hands on. Smiles, giggles and squeals LOADS - it's totally hilarious - I spend most of my day trying to make her giggle or squeal or chuckle. Is a happy-go-lucky little thing. I've been doing a little bit of crochet and a little bit of sewing again. But for now, I just wanted to say "Hello" and "I'm still here"
Just what you want from a little girl with a cheeky glint in her eye. My name is Bindu. I'm a mum, an actress, a film director, an avid crafter, an amateur sewer, wannabe baker, cookbook hoarder, crochet enthusiast, thrifter, vintage shop browser, VW camper van owner and car boot sale wonderer... 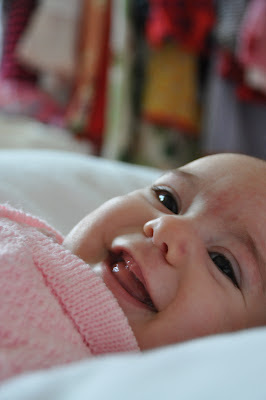 The birth of my baby girl Nina, inspired me to start this girly blog. Enjoy! please link them back to me and my blog. Copyright For My Girl Nina. Awesome Inc. theme. Powered by Blogger.